Willow Lifestyle is perfectly placed in the Georgian market town of Lymington, where the New Forest meets the sea. Here, we experience an ever changing display of colours and textures. This often gives us interior design ideas for creating a relaxing and tactile showroom blending furniture and home accessories to inspire and inspirit. Our interior design team love creating down to earth, liveable interiors that are both comfortable and stylish. Our friendly open approach is complemented by years of experience. Lucy and Jean, our two in-store Interior Designers are ready to listen and inspire you with options, ideas and inspiration to get the most out of your home. Our South Coast location means we often get clients wanting our help to create the “Coastal Style” in their homes or holiday homes. Our rustic paired back aesthetic lends itself to building a beautiful subtle coastal feel in the home layering our driftwood coloured floorboards, light airy linens and a great mix of textures coming through in accessories and soft furnishings. 1. Keep it simple and laid back, organic and unfussy! For us, coastal style is all about the relaxed “kick your shoes off” simplicity. 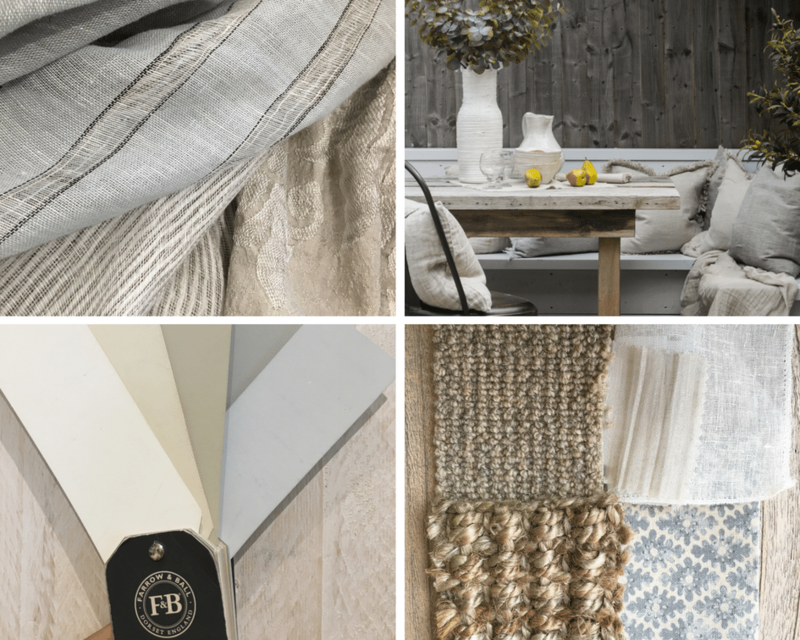 We love using textures of chunky raw linen on cushions and throws. Combined with grey wicker baskets, subtle stripes on light airy window treatments, to build that beachy feel. 2. 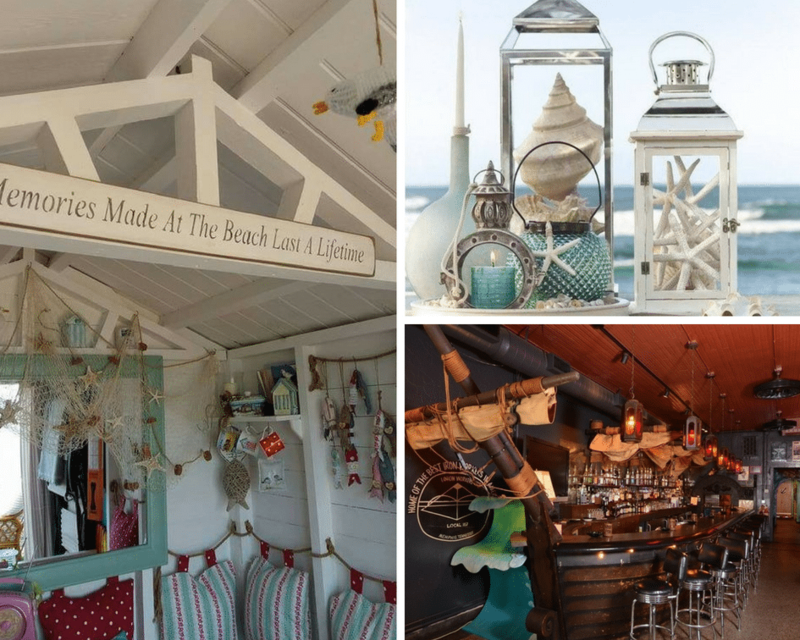 Let your palette be inspired by colours you typically see on our British coastline – pebbles, sea, sky, driftwood even the brights tend to be sun bleached and work on fishing boats and beach huts. We love Farrow and Ball and Little Greene for their edited paint colours and timeless feel. 4. When walking along the beach, it is very tempting to collect lots of beach treasure and bring it home. Keep it contained on a tray or use a small collection of pebbles or shells in a glass jar. This will add the finishing touch and create a really unique display to your room. The idea is to keep it simple and uncluttered. 5. Finally something for your walls, a unique piece of artwork to tell the story of you. Artwork is so personal it doesn’t need to cost the earth. It can add the finishing touch to personalise your home. Explore local artists in your area. We love calling in at The Coastal Gallery or Saltmarsh Gallery here in Lymington. 1. Luxury accessories are designed to add a finishing touch. 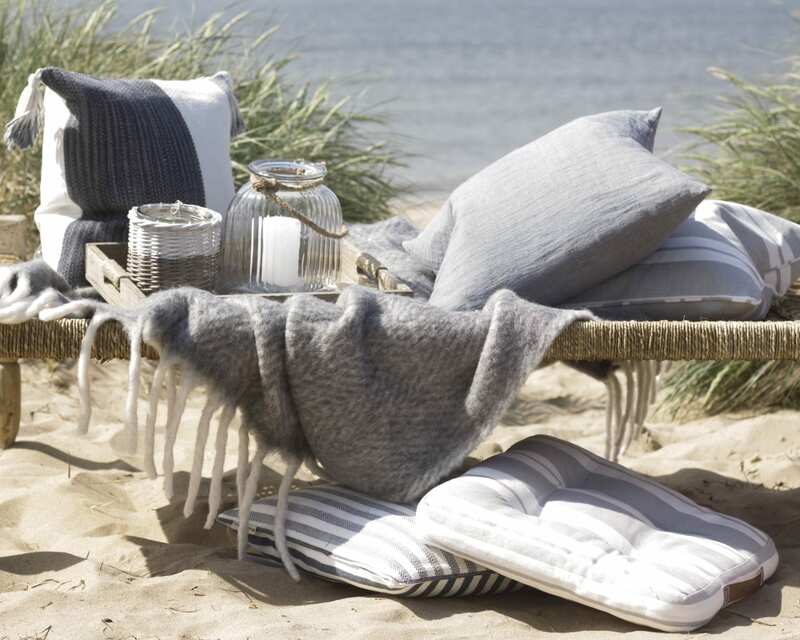 Be careful not to over clutter with beach huts, flags, stripes and references to seagulls and sailing on every curtain cushion and surface. Think stylish and subtle. Being too obvious can easily tip the balance resulting in an over themed downgraded interior. 2. Don’t be too precious. Save the “dry clean only” and “hard to clean” shiny surfaces for elsewhere, coastal style is all about relaxed living, charming and rustic. 3. Limit nautical references to coastal locations. Tell the story of you.Those carefully selected shells and subtle textures can look just as good in inland properties and bring back wonderful memories of carefree days at the seaside. Whether you are refreshing one room or taking on a full from scratch project, we’re happy to help. Take a look at our completed portfolio of finished projects for inspiration. Let Willow Lifestyle help you to rediscover your living space and tell your story. Contact us today, come in to our store or visit our website. More Interior Design Ideas and Tips? Sign up to our newsletter to keep up to date with Interior Design ideas, style tips, new products and in-store events.